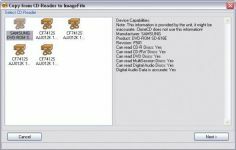 CloneCD is a powerful CD copy software that creates copies of original CD's. CloneCD is a powerful software that allows to create a copy of an original CD. The program is not limited to CD since it is also able to establish a appropriate reproduction of a DVD (-R,-RW, + R, + RW, + R Double Layer and RAM.). CloneCD is able to burn a support from an ISO image or UDF, created with an external program like Nero, DVDShrink or CloneDVD. It writes in "raw" mode which allows a total control on the written data. Clone CD produces exact copies of the CDs as no program is able to do so far. One amazing thing about CloneCD is that it can be used as a removal tool. - New: Accept keys sold by RedFox.